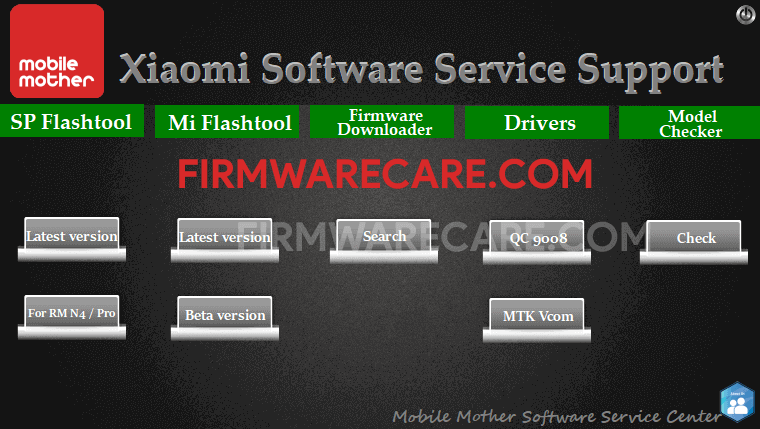 Xiaomi Software Service Support is a small application for windows computer created by Mobile Mother Team, which compile a list of very useful Tools for Xiaomi Smartphone including Sp Flash Tool, Xiaomi Flash Tool, Xiaomi Firmware Downloader. It allows you to download the latest version of SP Flash Tool, which allows you to Flash the stock Firmware or Recovery on Mediatek based Xiaomi Smartphone. Xiaomi Flash Tool allows you to quickly flash the Stock Firmware on Xiaomi Devices running on Qualcomm Chipsets. Xiaomi Firmware Downloader allows you to quickly download the Stock firmware of almost every Xiaomi Smartphone in the World. Xiaomi Drivers allows you to connect your Xiaomi Smartphone to the computer without installing any external application on the computer. In order to use the Xiaomi Software Support Tool you need to install the Universal ADB Driver on your computer. [*] Compatibility: The Xiaomi Software Service Support runs perfectly on Windows XP, Windows Vista, Windows 7, Windows 8, Windows 8.1 and Windows 10 (32 bit and 64 bit). [*] Credits: Xiaomi Software Service Support is created and distributed by Mobile Mother Team (developer). So, full credits goes to Mobile Mother Team (developer) for sharing the tool for free.